The thinner and smaller ThinkPad X1 Carbon laptop, X1 Tablet, and X1 Yoga 2-in-1 get upgraded to Intel Kaby Lake chips . The venerable ThinkPad brand will turn 25 this year, and Lenovo’s new ThinkPad X1 devices will kick off celebrations with a slew of upgrades including sexier designs, faster processors, and screens with thinner borders. The new ThinkPad X1 Carbon laptop (starting at $1,349), ThinkPad X1 Tablet (starting at $949) and ThinkPad X1 Yoga 2-in-1 (starting at $1,499) are smaller, thinner and lighter than ever before. In addition, the devices have much longer battery life. Many of the advances come thanks to the upgrade to Intel’s 7th Generation Core processors code-named Kaby Lake. The integrated GPUs are faster and provide the capability to support 4K video processing. Additionally, an intriguing optional offering for the ThinkPad X1 devices will be LTE-Advanced modems from Qualcomm, which are typically found in smartphones. Lenovo believes cellular connectivity is a must as devices become thinner and lighter. LTE connectivity is also good for where Wi-Fi isn’t available. After staying backstage in previous years, the X1 Carbon is at the front and center of the new upgrades. The 14-inch laptop has shrunk considerably, and is now in the frame of a 13.3-inch laptop, much like the Yoga 910. That’s partly because of a new screen with thinner borders, which helped reduced the size of the laptop. It’s not exactly an edge-less display like the XPS 13, but it’s still extremely thin. A webcam is placed in the thin border on top of the screen. The laptop does not have a “nosecam,” said Bhatia, taking a jab at Dell’s XPS 13, which has an oddly placed webcam under the screen. Reducing the laptop’s size has other benefits. The X1 Carbon is lighter than before at 1.14 kilograms and also boasts a longer battery life of 15 hours. Users can configure the laptop with up to 1TB of SSD storage and up to 16GB of DDR3 DRAM. The screen options include full HD or the higher resolution 2560 x 1440-pixel screen. A 4K screen option isn’t available, Bhatia said. The 2-in-1 includes a pen, which takes advantage of the new inking features in Windows included in the Anniversary Update. The pen is becoming an important part of Windows devices, and it’s much easier to take notes and draw on the X1 Yoga, Bhatia said. 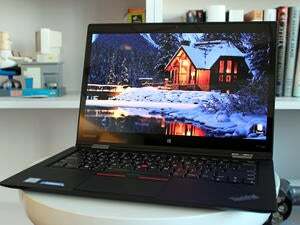 Finally, the multi-purpose ThinkPad X1 Tablet, which stole the show at last year’s CES, also got major upgrades. It’s a detachable device that turns into a laptop with a keyboard module, or can create a 60-inch projection display when a projection module is attached. It has a 12-inch screen that displays images at a 2160 x 1440 pixel resolution, a storage capacity of up to 1TB, and memory capacity of up to 16GB.